The analysis of 2016 sources found reports of religiously motivated harassment – whether perpetrated by governments or social groups – in the vast majority of the world’s countries (187, up from 169 in 2015). 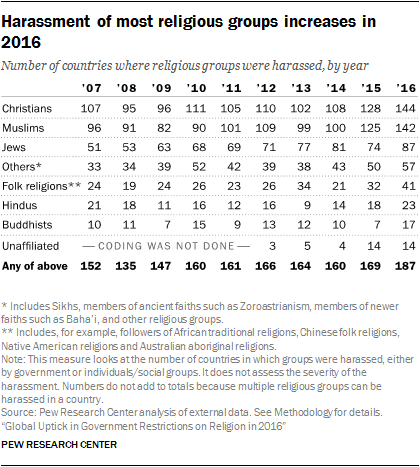 This marks the biggest number of countries where harassment was observed against religious groups since Pew Research Center began analyzing restrictions on religion in 2007. Harassment of members of religious groups takes many forms, including physical assaults, arrests and detentions, desecration of holy sites, and discrimination against religious groups in employment, education and housing. Harassment and intimidation also include things like verbal assaults on members of one religious group by other groups or individuals. Christians and Muslims have typically been harassed in the largest number of countries around the world. These two groups are the largest religious groups in the world and have substantial populations in more countries than other smaller and less geographically dispersed religious groups.